I feed my cats a homemade raw diet. I think raw diets are the “gold standard” in feline diet. However, I will state loudly and adamantly up front – I THINK CANNED FOODS ARE A PERFECTLY ACCEPTABLE CHOICE! However, there is NO DRY (KIBBLE) FOOD I deem acceptable. I will occasionally use a freeze-dried food, freeze-dried treat, or dehydrated treat as a TREAT, but not a meal… and you have to be CERTAIN they are truly freeze-dried, air-dried, or dehydrated, not processed – as many food labels are deceptive. Even if these items were ideal in every other way (low in carbohydrates, little-to-no veggies, fruit, grains, etc.) they are LACKING IN MOISTURE and that moisture is imperative to proper kidney and urinary tract health. Doing it “right” does not mean it has to be difficult! Personally, I buy a pre-ground meat/bone/organ product (Hare Today) and add a few supplements. It is SIMPLE. See the video below! Diabetes: High carbohydrate diets can lead to diabetes mellitus. Dry food, even “low-carb” dry food, is naturally higher in carbohydrates than most canned foods, as it requires a starch to create “kibble”. Dry food is also more processed by heat, and thus more glycemic than wet food – raising blood sugar levels. Kidney disease (CRF): Lack of moisture in dry foods leaves cats subclinically chronically dehydrated, compromising kidney health. 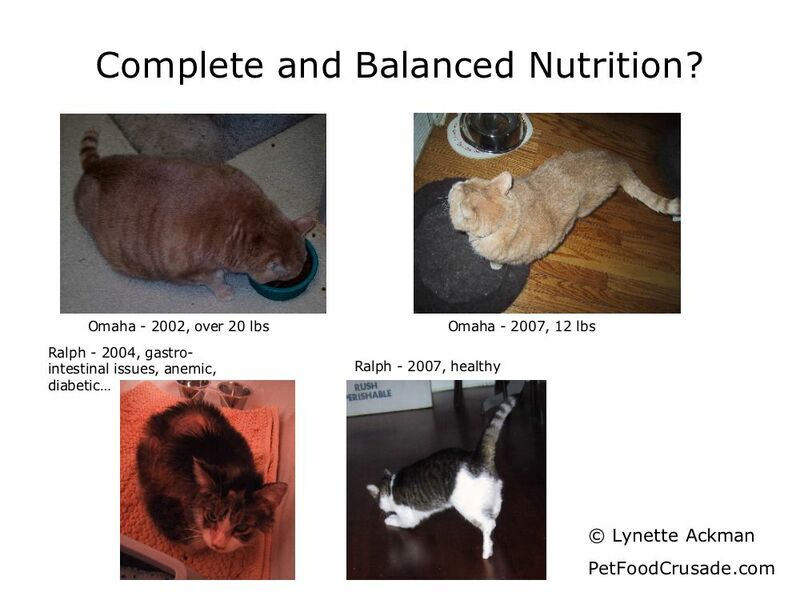 Obesity: As noted above, dry food is high in carbohydrates. Low-carbohydrate diets have been shown more effective at weight loss while maintaining lean muscle mass than high-fiber foods. “Low-carbohydrate” dry foods have been shown ineffective at weight loss, as they are very high in calories. Urinary tract disease (FLUTD): Lack of moisture in dry foods increases urine’s specific gravity, leading to cystitis (urinary tract inflammation). Regular non-prescription canned food has been shown more effective at preventing recurrence of urinary tract stones/crystals than prescription dry foods. Gastro-intestinal disorders (IBD): Grains are not tolerated by many cats, causing diarrhea and vomiting. Excessive fiber may stretch and inflame the GI tract, leading to constipation and megacolon. Carbohydrate malabsorption has been linked to gastro-intestinal problems. Cancer: Heat processing of grains and potatoes creates acrylamide, which has been shown to cause cancer in animals. Many dry foods also contain preservatives such as BHA and BHT, shown to cause cancer. A low-carbohydrate food has been shown beneficial in slowing cancer growth as cancer cells seem to “feed” more easily on simple carbohydrates (and again, wet foods are lower in carbohydrates and less glycemic than dry foods). FelineOutreach.org, CatInfo.org and CatNutrition.org are all great sources of information. Visit PetFoodCrusade.com for information on pet food safety. Note: I neglected to mention hepatic lipidosis (fatty liver disease), asthma/allergic respiratory disease, dental disease, and heart disease… that would have made ten reasons – not that I personally needed more. Nutrition and Cancer: New Keys for Cure and Control 2003! For more information, visit Feline Outreach.